The Milton Keynes project was the first residential focused city-wide deployment to be announced by the operator at the start of last year (here), which now forms part of their wider £2.5bn plan to reach 1 million UK premises by the end of 2021 and 5 million by the end of 2024 via 37 UK cities (here). As such it makes sense that this is the one where they’ve also made the most progress to date. The new fibre is being built outward from their existing 162km long Dark Fibre network (acquired from KCOM at the end of 2015), which since March 2018 has now doubled to over 350km. 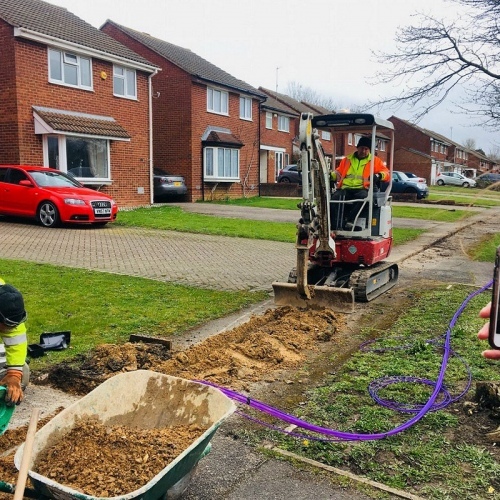 CityFibre has so far built in Bancroft, Blue Bridge, Bradville, Great Linford, Willen, Bletchley and Fenny Stratford, and will be accelerating across the city to reach “almost every home and business” (they tend to aim for 85-90% coverage or more). Apparently the local build is still on track to complete by the end of 2020 and Cityfibre recently opened a new office in city. On top of that they also intend to bring their “Engineering Centre of Excellence” to the city. The operator is currently in the process of gradually ramping-up their deployment pace across the United Kingdom. A recent report from Regeneris forecast that bringing “full fibre” to the city could be worth £62m to the local economy in terms of greater innovation and productivity within businesses, while the value of local homes could rise by £119m. As usual it’s wise to take all such predictions with a pinch of salt because it remains notoriously difficult to accurately model the economic impact of faster broadband speeds. The Gigafast Broadband packages from Vodafone currently cost from £28 per month for an unlimited 100Mbps (symmetric speed) service on an 18 month contract, including free installation (you also get a very good wireless router), which rises to £48 for their top 900Mbps (Gigabit) tier. This is much more attractive than the alternative FTTP and G.fast based services currently being offered by Openreach (BT) based ISPs in the area. NOTE: Cityfibre’s MK deployment has now reached a similar or better level of local coverage to Openreach’s existing FTTP network. Cityfibre seem to have removed the press release from public display, albeit without any explanation. We are trying to find out why but Thinkbroadband’s data suggests that it might be because the 10,000 premises passed figure they gave was too low (we think they’re much closer to 20,000). The operator has confirmed that they got the original announcement wrong and the figure should be “over 20,000“. Unfortunately they will still not give any indication of when they will rollout to specific areas in the city. This leaves me (and many others) in a pickle as I’m almost at contract renewal on my BT FTTP product and have no idea if it’s worth me paying for a couple of months at the high out-of-contract rate in anticipation of CF building in my area soon.